Hundreds of Thousands of 1940’s Tax Photos are Now Available to View Online! From 1939-1941, every building in New York City’s Five Boroughs was documented in a series of Tax Photos through a joint effort by the Works Progress Administration and the New York City Department of Taxation. The culmination of a long-awaited digitization effort, these images have now been made available online through the Municipal Archive’s digital gallery. This digitization provides unparalleled access to this crucial tool for researching the history of our city’s buildings. The image negatives from the 40’s were left untouched until 1980 when they were sent to Denver, Colorado and transferred to microfilm strips that were cataloged and returned to New York City. Viewing the 1940’s tax photo of a property used to mean a trip to the Municipal Archives downtown where they are permanently housed, but now the full collection of more than 700,000 images can be accessed from the comfort of your home or office. Just find the block and lot numbers of the address you wish to view to access the appropriate record within the collection. Happy exploring! 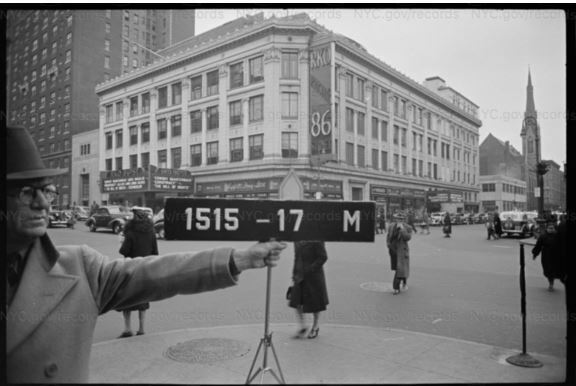 “720,000 New York City tax photos from 1940 are now digitized so you can find your building online.” by Michelle Cohen, 6sqft, November 5, 2018. “The 1940 Tax Photos-A Well-Traveled Collection.” by Kelli O’Toole, New York Department of Information Services Blog, November 2, 2018.